Something historic just happened at the Harrison County Animal Control Shelter in Indiana. For the first time in the shelter's 13 years of operation, things are quiet at the small shelter. The pitter-patter of paws in the dog kennels has gone still; there is no purring or meows to be heard from the rows of cat cages. Silence has never sounded so good. Why? It means all the pets found a home. 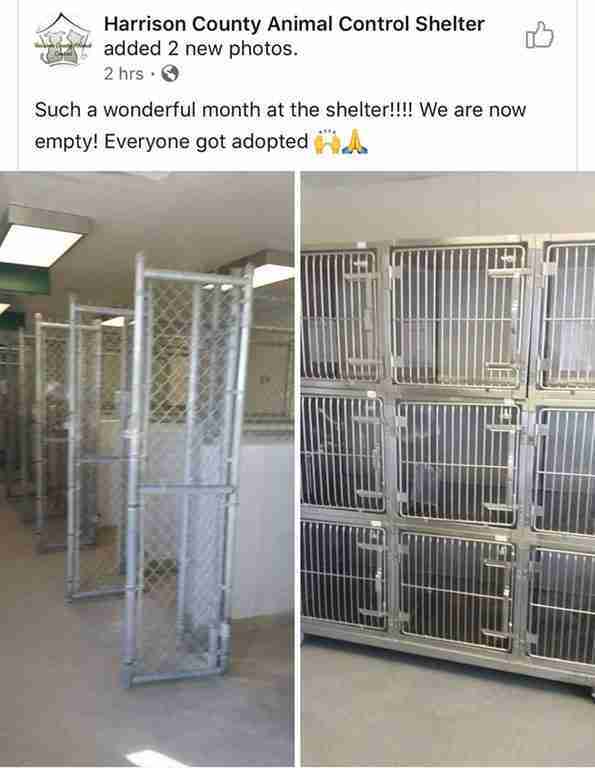 Here's how the shelter announced the good news. The good news has gone viral. On Facebook, hundreds of people liked and shared the shelter's post; tens of thousands more signaled their approval on Reddit. And the participation of people online is actually a big reason why the shelter was emptied. "We attribute our adoption success to the social media community," shelter office manager Amber Brewer told The Dodo. As the shelter posts about available pets, and those who might be lost, folks following on Facebook forward them along to friends and family — a small act that can go a long way. "Their posts on social media are instrumental in maximizing the visibility of every animal, from those available for adoption, to stray animals getting reunited with their families," Brewer said. "They truly make a huge difference." Indeed, for people who can't adopt for whatever reason, every share counts when it can help a pet in need. After all, the shelter likely won't stay empty long.